Gum disease. Why you should be concerned. A GP's insights. Gum disease. Why you should be concerned. A GP’s insights. How many of you expect to be asked by your doctor about the health of your teeth and gums? 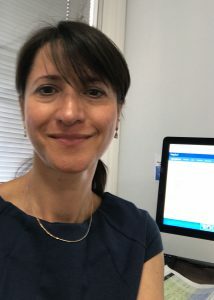 I’ve been a GP for nearly 20 years and when I ask my patients about the state of their teeth and gums as part of their general medical history they still look surprised. Almost everyone nowadays expects to be asked by their doctor about their smoking, diet and exercise habbits and almost everyone is aware that they are risk factors for their overall health. But how many of you are aware that the state of your teeth is also a risk factor for your health with gum disease linked to lots of health problems in other parts of your body? Most of you when you think about gum disease, you might link it to bad breath, bleeding, swollen or tender gums, loose or sensitive teeth. No doubt these are common effects of what gum disease can do to your mouth. 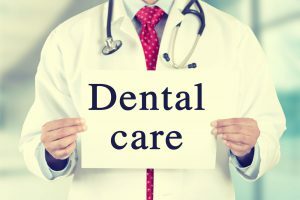 However, there is more and more evidence that gum disease could also be related to other serious health problems that you may not expect, including certain cancers and dementia. This is rather alarming considering that gum disease can be preventable. But this should also be good news for the same reason. We will look at how gum disease could be prevented further below. Before we do so, let’s try understand why gum disease and overall health are linked, go through the highlights of the most common health conditions and if there are any differences for men and women. Gum disease and health conditions – How could they be linked? There are a number of theories as to why the health of your gums and the rest of your body could be related.To understand these, we first need to understand how gum disease develops. Your gums protect your teeth and the structures that hold them in place. If you don’t brush and clean between your teeth well and often enough, bacteria, mucous and food particles can build up to form a layer known as dental plaque. Dental plaque invades the small space between your gums and teeth and leads to inflammation of the gums surrounding your teeth, causing them to become swollen and sore, and sometimes to bleed. This is known as gum disease. If left, your gums can become infected, putting them and your teeth at risk. So what happens once gum disease has developed? For a long time it was thought that it was the bacteria in the dental plague that linked gum disease to other diseases in the body. 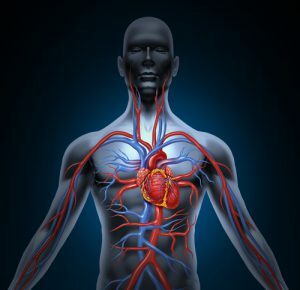 In the case of heart disease, the theory was that bacteria could enter the blood stream, settle on existing coronary artery plaques and help form clots in the arteries that supply blood on your heart muscle. More recent research suggests it is chronic inflammation that may be responsible for the link to serious diseases. The body responds to the increase in the bacteria in the mouth by producing inflammatory markers. Prolonged chronic inflammation can then damage blood vessels. This could play a part in diabetes, rheumatoid arthritis, chronic kidney disease and some forms of cancer. The current thinking is that treating inflammation may not only help manage gum disease but may also help with other chronic inflammatory conditions. Studies indicate that gum disease increases the risk of coronary artery disease almost twice compared with people without gum disease. It can also exacerbate existing heart conditions. Some heart conditions such as valve disease may require antibiotics prior to dental procedures to minimise the risk of a serious infection called infective endocarditis. If you have a heart condition your doctor (GP/cardiologist) and dentist will be able to advise if you require antibiotics prior to dental procedures. Studies have indicated a relationship between gum disease and stroke. 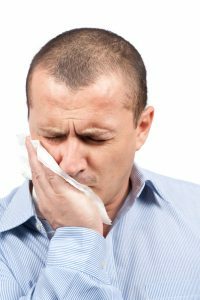 In one study people diagnosed with an ischaemic stroke were found more likely to have an oral infection when compared to those in the control group. It has been well known that if you have diabetes you are at a higher risk of developing gum disease and the higher the blood sugar levels the more severe the gum disease. Research now suggests that the relationship between gum disease and diabetes is more of a two-way process than we first thought. Not only having diabetes increases your risk of gum disease, but having gum disease also increases your risk of developing diabetes. In addition, if you have diabetes and gum disease you are six times more likely to have your blood sugar worsen over time than if you did not have gum disease. This can also increase your risk of diabetic complications and kidney disease compared to people with diabetes but no gum disease. Your airways lead from your mouth to your lungs and if your mouth contains a lot of bacterial plaque, the theory is that you could then breathe this into your lungs. Once inhaled, bacteria could then go on to cause an infection in your lungs such as pneumomia or could aggravate an existing condition. 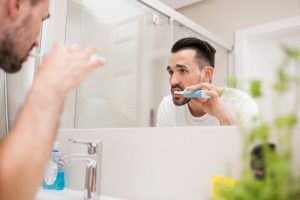 Gum disease – should men be more concerned? Research has found that gum disease is higher in men (56.4%) than in women (38.4%).This may be because men are less likely to go to the dentist or are more prone to gum disease than women or women take better care of their teeth. Whatever the reason for the higher risk, if you are a man you have some addtional reasons to be more mindful about the health of your gums, which include higher risk of heart disease, prostatitis, impotence and cancer. We have already discussed the effect of gum disease on the heart and the link with heart disease. However, as a man you already have a higher risk to develop heart disease than women so if you have gum disease it increases the risk even further. You may have heard of the PSA (Prostate Specific Antigen), an enzyme produced in the prostate which is normally secreted in very small amounts. When the prostate becomes inflamed, infected or is affected by cancer, the PSA levels rise. Research has shown that if you have prostatitis (inflammation or infection of the prostate) and gum disease then you have higher levels of PSA compared to men with only one of the conditions. This means that gum disease may affect the health of the prostate and vice versa. According to research if you have gum disease and you are younger than 30 or older than 70, you are at increased risk of developing impotence. It is thought that the link is inflammation and prolonged chronic inflammation, which can damage blood vessels leading to impotence. If you have gum disease you are 14 percent more likely to develop cancer than men with healthy gums. Specifically, you may be 49 percent more likely than women to develop kidney cancer, 54 percent more likely to develop pancreatic cancer, and 30 percent more likely to develop blood cancer. Gum disease – what about women? If you are pregant and have gum disease, the evidence suggests that you may be more likely to have a baby that is born too early and too small. It is highly advisable that you consider the health of your mouth and gums before you become pregnant and throughout your pregnancy. The menopause may affect many parts of a womans’ body and the mouth is no exeption. If you are menopausal you may notice discomfort in the mouth, including dry mouth, pain and burning sensations in the gum and altered taste, especially salty, peppery or sour. In addition, gums may look dry or shiny, bleed easily and range from abnormally pale to deep red. Estrogen supplements may help to relieve these symptoms. Gum disease and long-term conditions have lots in common in terms of the lifestyle you lead. It is thought that if you don’t take care of your general health, by having a healthy diet, not smoking and doing regular exercise, then you may not be looking after your dental health very much either. For this reason, people who may develop chronic conditions such as heart disease, stroke, diabetes, may also be at an increased risk of developing gum disease, because of the lifestyle choices they make. How can you prevent gum disease? Keep dentists and doctors involved! As a GP I would also like to reiterate some of the behaviors that are good for your overall health and help protect your gums. These include eating a healthy diet that’s low on sugar and high on whole grains and not smoking. It is also important that you let both your GP and dentist know about your medical history, any family history of heart disease, stroke or diabetes, and if you have noticed any bleeding or swelling in your gums or problems with your teeth. From what we know so far there is a link between the health of your mouth and the rest of your body. A little extra attention to your gums with a good cleaning routine and regular visits to your dentist and a lifestyle that includes a healthy diet, regular exercise and no smoking can keep you healthier than you thought. ( www.medicalprime.co.uk ), private GP services within CAP City Dental.